Apparently still irritated by the way UCLA transfers Larry Drew and Travis and David Wear abruptly left North Carolina, a photoshop-savvy fan decided to poke fun at the ex-Tar Heel trio and their new school. 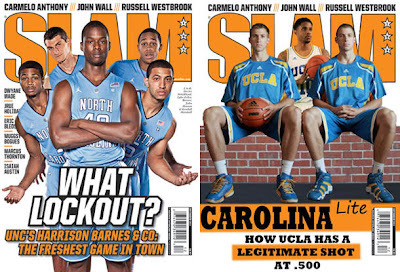 The above image on the left is the cover of next month's SLAM magazine championing North Carolina as national championship favorites The above image on the right is a mock SLAM cover created by an unidentified fan touting UCLA as a potential .500 team. The creative ribbing from North Carolina fans is a product of anger over the manner in which Drew and the Wear twins left the program. The timing of Drew's departure irritated North Carolina coach Roy Williams since the junior guard left soon after freshman Kendall Marshall supplanted him as starting point guard during conference play last year, leaving the team without a backup at the position. Williams also called it a "complete surprise" when he received a call from the Wear twins' father in May 2010 informing him they were leaving the program, a decision that forced the Tar Heels to scramble during the summer to find a third big man last year. Drew won't be eligible to suit up for UCLA until the 2012-13 season, but the Wear twins will have a chance to prove their Chapel Hill critics wrong beginning next month. They're both expected to be integral parts of a deep, talented UCLA frontcourt ranked among the best in the nation.